Whether you opt for an electronic tool or a free printable, to do lists have a lot of advantages. For instance, free printable weekly to do lists reduce anxiety by creating a blueprint of what you have to get done during the week and allowing you to see it all laid out. 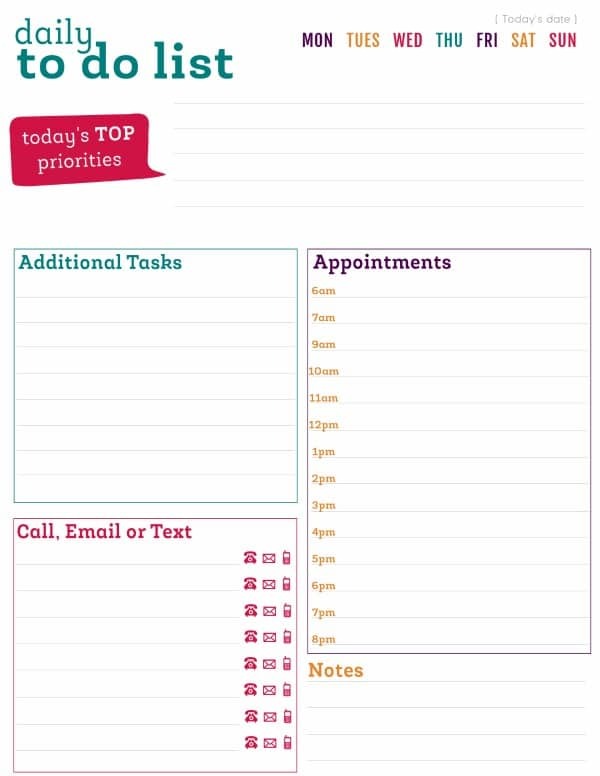 Printable daily to do lists do the same on a daily basis. To learn more about the power of to do lists, check out this article List Making Will Save Your Brain. – Free printable weekly and daily to do lists allow me to focus on what I have to get done. When I try to use electronic options I seem to always get distracted by other things like emails. – They allow me see to everything I need to do, prioritize tasks, and group like things. On electronic tools like calendars, I can’t always see everything at once side-by-side. – They allow me to easily make updates or track progress at any time. With electronic options, it can be difficult to quickly make updates and what if I don’t have my phone or aren’t at my computer? – They allow me to achieve a sense of accomplishment. Studies have actually shown that crossing something off and visually seeing it is completed is more satisfying than merely deleting it from your screen. If, like me, you prefer free printable daily and weekly to do lists over electronic tools or just want to give free printable to do lists a try, here are two free printable to do lists to get you started. 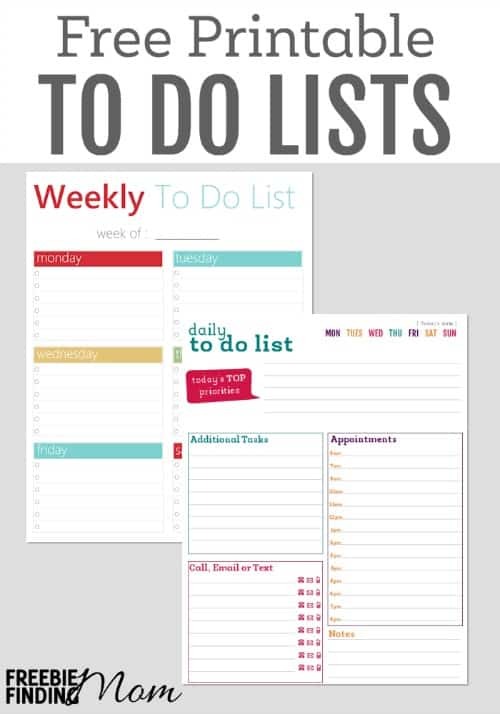 Download your Free Printable Daily To Do List and Free Printable Weekly To Do List now! Use these two free printable to do lists together. Print out 7 of the daily to do lists and one of the weekly to do lists for each week. Fill out the daily to do lists as much as possible. Give yourself plenty of time and if possible, quiet to do this as you don’t want to forget anything. 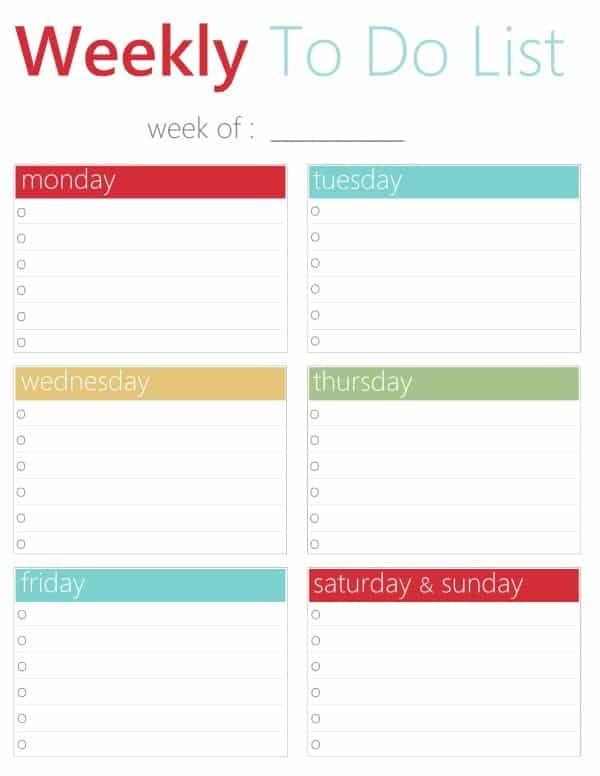 Then put the “highlights” (big, important things) on the weekly to do lists, so you can get a sense of your schedule for the whole week at a glance. Then be sure to keep these free printable to do lists handy! Have other ideas on how to effectively use these free printable to do lists? Please share in the comments! Want more awesome freebies like these free printable to do lists? Follow Freebie Finding Mom’s Freebies Pinterest board. do you have a link to where we can get all of the free printable s? Some of these links are not working…if you could email it to sahmoftwins2004@gmail.com it would be great. thanks. I’m needing the link for the free printable link as well. Thanks in advance! I can’t find the link, can you please email them to me at cgiann92@gmail.com? Can I get on of these free printables too? Hi Kelli! I can’t find the link as well for the free printable, would you please email them to me? kbodell17@gmail.com. Why are the links not working? You have some of the greatest Printables here, but none of the links I have clicked on work. I love all the brightly colored ones. Could you please fix them or package the Pdf’s in a Zip Package so we can get them all at once if we want them all? You can get the 7 Zip application, it is free and works great :). I hope this helps your blog out some. Hi Kelli, love the printables but cannot seem to get any of the links to work. Can I please get the printables as well? Love the printables but cannot seem to get any of the links to work. Im not having any luck downloaing a single printable you have to offer. And after a few attempts on a few different printables i was interested in i figured I’d just give up and let you know. I was also wondering if id be possible and not to much of an inconvenience for you to just email me the organization, budget and your to-do list. I love all the ones you have to offer and everything on your site is so interesting. Keep up the great work 🙂 and below is the message i see instead of a download option..
Hi, I love the printables, would you please be so kind as to email them to me? I activated my subscription and received my code, but sadly there is no place on this page to enter the code. I was interested in downloading the weekly cleaning schedule for starters. Hello I signed up for the free printables, received the code however still was unable to access the printables. Every time I clicked on a printable to redirected me back to the sign up page. Please assist. I cannot find a way to download any of the free things. There are several I would like to try. Any help would be great.